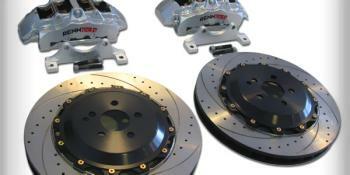 RENNTECH Big Brake Upgrade MERCEDES-BENZ - Dezod Motorsports Inc - Home of the automotive performance enthusiast since 2002. No supercar can be complete without phenomenal brakes – and while braking systems are often overlooked by other tuners, RENNTECH understands that brakes are one of the most important components of any performance car. With up to 410 mm (16.2”) front rotors (14” rear) grabbed by big 8-piston calipers, RENNTECH’s big brake upgrades are some of the most capable systems available at any price. Designed specifically to complement and control the mass of high-performance Mercedes and AMG cars, RENNTECH’s big brake packages deliver consistent, REAL WORLD performance and look great behind your performance wheels.